A semi-wild garden with wildflowers and grasses will be filled with bees! On the day of this daily wildlife challenge, bees were active on foxgloves and fruit trees, down in the wild patches of nettles and green alkanet and amidst the hazelnut and other British native trees, including a willow that seems to be self-rooting and growing all over again! 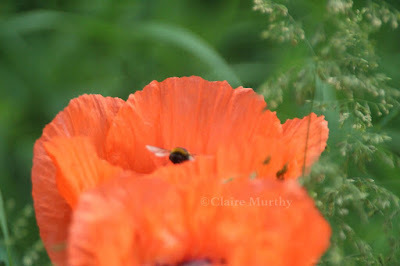 But this bee on a poppy in a park was most engaging and active - on such a vibrant splash of colour! Busy Bee : A bee enjoying the colours of Spring. There are many ways to follow a bee…this bee poem does it beautifully! For the #30dayswild post in 2016, Nature Challenge : Follow a Bee (which resulted in a watercolour illustration), click here. More information about identifying common UK bees can be found at Woodland Trust.